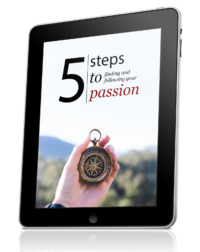 What would you say if I said you could start following your passion today? Would your mind come up with an untruth to stop you from taking action, or would you be excited and ready to go? It’s easy to come up with excuses, but in the end, you really have to think about what you want to do. I knew at the age of 17 that I didn’t want a regular 9-to-5 job. I wanted the freedom to do whatever I wanted, and I was ready to work hard to get it. We all have that drive within us, but first, we have to peel off the layers of untruths. You don’t have to choose one passion to follow and that’s it. You do, however, have to choose one passion to focus on for a while, otherwise you’ll just sit there overwhelmed, not knowing what to do. It wasn’t until I started focusing on one thing at a time that I started making a living online. I have several income streams, but I worked on each one of them separately. You don’t have to quit anything. That’s just another excuse not to get started. If you watch TV, read magazines or do anything else that could be looked upon as “wasted time”, then you can easily find time. One or two hours of focused work per day on your passion will make a huge difference. Start with what you’ve got, and take things from there. Even though you’re doing what you love, it’s not always going to be easy, but it’s almost always going to be fun, interesting and exciting. You will have to work hard, take action and cut through your fears. No one has it all together. No one has it all figured out. We’re all afraid, confused, and overwhelmed from time to time. You don’t have to be what you think you have to be in order to be successful online. What you need is stick-to-itness, which comes easily when you realize that doing what you love is the only way to live. I’ve failed countless times, but I kept going, because the alternative of doing something I didn’t like did not appeal to me at all. Nope, you don’t. I’m afraid from time to time, or to be completely honest, the feeling I experience most at this time is confusion, but once I breathe and accept the chaos, things become much easier. When you take one step and one day at a time, everything becomes much more manageable and the fear shrinks. If you’re experiencing fear, know that it’s normal, acknowledge its presence and keep going. You do not have to “win the lottery”. It certainly may help, but if you persevere, learn and keep taking action, you will have the odds on your side. Getting lucky is overrated. It’s the journey that excites us. We’re here for the challenge, not for the drinks ;). Almost all ideas are derivative, which means that it is hard or nearly impossible to come up with an original idea, so don’t get stressed out over it. This blog is about living the life you want to live. There are probably thousands of blogs similar to mine out there, but I don’t care. This is what I want to do right now, and whatever happens, happens. You will never know what’s going to happen. Okay, some people might, but if you’re reading this, I’m guessing you don’t know how to predict the future, yet. The truth is that there’s no guarantee that you will make money. There’s no guarantee of you getting what you think you want. We don’t always know what we want, and we don’t know where this path may lead us. You may fail, only to end up somewhere else, which you later realize is where you wanted to be all along. That’s why I trust myself. It knows more than I do. When I started blogging, I didn’t know anyone. I still don’t know a lot of people. I’m not a natural networker (yet), and besides, right now, I’m just enjoying life. I started out commenting and guest posting, which is basically what got me where I am today. I’ve also made some interesting new friends along the way, which you will too, if you start! You don’t have to be all-knowing in whatever subject you’re passionate about. Being an expert is good, but not necessary, and it does not qualify as an excuse. 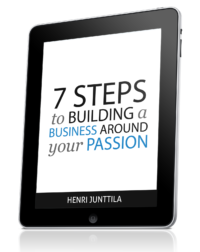 If you’re passionate, motivated and take action, you can write about the things you discover on your journey to mastery, and in no time, you will have become an expert in the eyes of your readers. Recently, I’ve started getting e-mails about how I learned English so well. I might have to write a post about it soon, but if your English is bad, it doesn’t take long to improve it, if you’re motivated. If going after your passion requires you to learn English then the decision is brain-dead simple, isn’t it? If you make a few mistakes here and there, you can learn as you go. As long as you provide good content, people won’t mind a few mistakes, and if they do, who cares? If you don’t like writing, you can make videos, podcasts, or you could even use a voice-to-text software. If you’d like to get better at writing then you have to write, and read, a lot. I was pretty horrible when I started making websites online, but I’ve improved a lot, and I did it through writing, writing, writing. Who’s interesting? It’s all relative. You don’t have to live a rockstar lifestyle, travel the world and meet tons of people. If you love knitting, you will attract the people that love knitting. You don’t have to be anyone who you are not. You only have to be yourself and do what you love. All of the things that are stopping you are untrue. If you want to do what you love then now is the time to start. You can always, ALWAYS, do something, even if it is for 20 minutes every day.